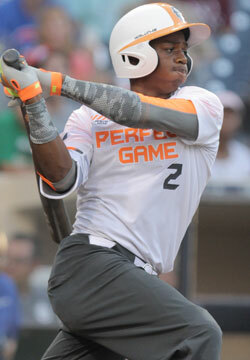 Lee turned a lot of heads at the Perfect Game National Showcase, as the athletic outfielder displayed an advanced hitting approach and feel for the barrel. Lee also generates considerable bat speed and pop from his compact frame. Additionally, Lee has easy plus arm strength that plays both in the outfield and on the mound where he’s reached as high as 90 mph with his fastball.